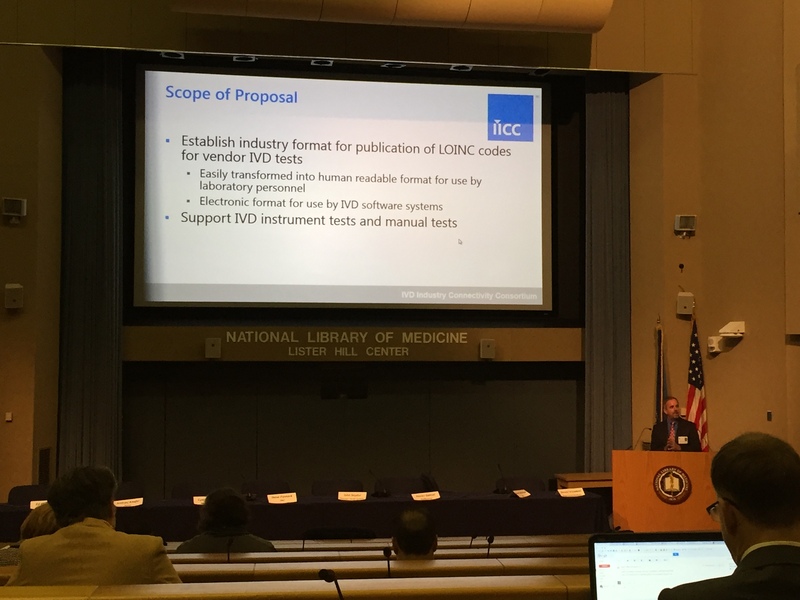 The IVD Industry Connectivity Consortium (IICC) presented its proposal for vendors to use when publishing LOINC for their IVD Tests at the November 8 Workshop on Promoting Semantic Interoperability of Laboratory Data at the National Institutes of Health (NIH) in Bethesda, MD. The workshop was organized by the Food and Drug Administration (FDA), the Centers for Disease Control and Prevention (CDC), and the National Institutes of Health (NIH) to receive and discuss input from industry stakeholders regarding proposed approaches to promoting the semantic interoperability of laboratory data between in vitro diagnostic devices and database systems, including laboratory information systems and electronic health records. LOINC (Logical Observation Identifiers Names and Codes) is currently the main vocabulary for identifying laboratory and clinical observations to electronically report test results. Unfortunately, to use LOINC, laboratories must still map their local codes to terms in the standard, a process that remains unnecessarily complex and error-prone as there is not always a one-to-one relationship between the tests that are run on laboratory instruments and existing LOINC codes. Erroneous mapping can result in the reporting of incorrect patient test results, with potentially detrimental consequences. This also prevents the industry from adopting a true plug-and-play connectivity standard that guarantees 100% correct and effortless test mapping. The new IICC approach, presented by Ed Heierman, should make it easier for laboratories to find the correct LOINC codes for the tests that they run on their instruments. The format is human readable, assuring that laboratory personnel select the appropriate LOINC codes for vendor IVD test results used by their laboratory. IVD software systems may also be able to automatically map the correct IVD vendor test result to a LOINC code.